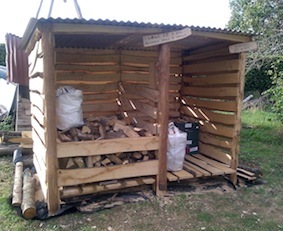 Most woodland owners quickly find that they generate more firewood than they know what to do with. It makes sense, environmentally and economically use it to heat your own home – and maybe that of their neighbours and friends, too. The most important thing to consider is making sure you season your wood sufficiently. Well seasoned wood should burn easily and be considerably lighter in weight than green wood. It may also have started splitting, with the bark peeling off. If you invest in a moisture metre you will get a more accurate idea, and you should be aiming to get the moisture content down below 25%. There are a lot of myths about what makes the best firewood. Some people insist on only burning oak, ash, hornbeam or hawthorn. All of these are excellent, but the best firewood you can get is the one you have in sufficient quantities. Most hard woods have roughly the same calorific value, but differ mainly in burning characteristics. If you’ve got loads of birch or willow, for example, you may have to cut more – you’ll also get more exercise moving it and stoking the fire! It is also important to know how much wood you will need for the winter, leaving a margin for error as a contingency in case the weather is severe. This will become obvious after a few years, but you will need to have a storage area which is covered to keep the rain off, with open sides to allow the air to circulate. It also helps if it is conveniently close to where you are going to burn it! If you can keep two or even three years worth of wood in this sort of environment, then you could put it into your store ‘green’. Make sure you have a good rotation system so you that the oldest seasoned wood is used first, while the newer green wood is drying out. You might be lucky and already have sufficient space under the eaves of your house, or you could construct an open-sided, slatted bespoke store, with separate bays to help with this rotation. If you use this method then just tumble the wood in rather than stack it neatly, as you the air needs to circulate around all of the wood. If you don’t have the storage space close to where you are going to burn it, then you will need to stack the green wood somewhere to season it before processing and moving it to its final resting place. Make sure it’s off the ground – birch, willow, even hornbeam – will rot quickly if in contact with the ground. Stack it on ‘bearers’ in a ride or open space where it is not going to be engulfed with undergrowth. If you leave it in a freshly cut coppice cant, the new growth will quickly grow around your stacks and inhibit the drying process, probably causing it to rot. Processing your cordwood into useable logs is the next step. The size of your log will depend on the size of your fireplace or stove. Today, most people’s fireplace will comfortably take an 8 or 9 inch log. If it is over 3 or 4 inches in diameter then this will also probably have to be split. If the wood is relatively knot-free and splits easily, you could use wedges to do this before you cross-cut it. This works well because you can construct a cross-cutting station from poles and cross-cut a large amount of ready split firewood in one go. If the cordwood is difficult to split, then I find it best to cut it into ‘rounds’ of the length you need for your log then and then to split it with a maul or a hammer and wedge. 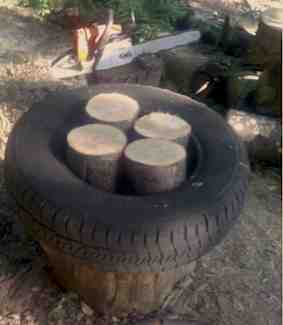 Attaching an old tyre to your chopping block will make the whole process easier as you can fill it with rounds then split each log to the required size without having to keep bending down to replace it. If you’ve any amount to wood to split, your back will be glad of this refinement. Keeping the number of operations to a minimum is the secret to managing your firewood. Round wood will take a bit longer to season properly than split logs, but if you’re in no hurry, just leave the cordwood propped up somewhere or stacked where the air can get at it. Getting it cut, processed, moved and seasoned close to the point where you are going to burn it is best and can save having to restack it. It’s hard work, but reassuring to look back at your efforts and know you’ve solved one of life’s fundamental problems – that of keeping warm during the long winter ahead.